I don't like to get political; this is not that kind of blog. But I'd feel like a fraud if I pretended all was joyful in my house today. Tears have been shed, probably not the last. It all seems so...raw. If you're happy with the outcome of this election, I'm sincerely glad there is some happiness to be found. I hope you will share that happiness with grace and kindness. But if you're sad, well then, like all flight attendants robotically tell us: "Put on your own oxygen mask first." Most likely, there's somebody who really needs you right now. Perhaps someone much younger and smaller, someone who can't even begin to process the sadness all alone. A little self-care goes a long way towards helping the people you love. Bubble baths have moved way up on my personal to-do list. And trips to the movies. And game nights. And I know, from experience, that some relief can be found in tears. I've extended the $10 discount for my upcoming e-course, Beyond Auto Mode: How to Really Work Your DSLR Camera. Join me online and let's tackle (and tame) your camera together. I invite you to subscribe to weekly posts from Joyfully Green via email or RSS reader: just click here. But sometimes, strangers turn out to be kind souls. I learned this recently, when I couldn't attend the BlogHer16 convention in Los Angeles to receive my Voices of the Year (VOTY) honor in-person for the blog post I'd written about my son called All of a Sudden: Twelve. It turned out that my nine-year-old daughter was performing in a local play on the same day as the VOTY presentation. I felt like I'd be a complete hypocrite if I skipped my daughter's play to fly to the opposite coast for a blog award about parenting! Via BlogHer's Facebook page, some very kind souls (whom I've never met) offered to take pictures of my post at BlogHer and send them to me. (It's a BlogHer tradition to super-size all of the honorees' work and display it gorgeously in the convention hall.) The day of VOTY, I received a whole slew of emails and texts with pictures similar to the one below. It was the next best thing to being there! To "pay it forward", I'm including links below from a couple of my kind new friends who snapped pictures for me. I do hope you'll check out their impressive work--they fully deserve the good karma! Casey Gates was a Voices of the Year honoree for this inspiring short film: What is Lady Brain? I hope that your weekend is filled with kind acts--given and received! P.S. I'll be taking a short blogging break for some highly anticipated family vacation time, but if you're on Instagram, I'll be posting (almost) daily visual inspiration from my wanderings, so come say hello to me on Instagram by clicking here. © 2016 by Joy Sussman/JoyfullyGreen.com LLC. All rights reserved. All photos and text digitally fingerprinted and watermarked. The BlogHer convention picture within this post was taken by Casey Gates. Please do not use any photographs without asking me first for permission at JoyfullyGreen.com@gmail.com and then clearly linking back to this site with photo credits. Site licensed by Creative Commons. Today I am writing you a permission slip, if you think you really need it. (You don't). It's your ticket to letting yourself relax, care less about what some people think of you, and notice more of the world right outside your door. Because sometimes, that means looking like the crazy neighbor. You know, the one who is lying flat down on the front lawn to take a picture of a ladybug climbing on a blade of grass, when the other neighbors are driving off to work, hunched over in their cars, disapproving scowls aimed in your direction. Or maybe they're just immersed in their own worries or petty miseries, too caught up in their personal dramas to notice you lying flat down on the front lawn. Maybe that lady who is joylessly tugging her dog down the street will see you--the one who is yelling into her cell phone at somebody who needs a good chewing-out. Maybe she will stop mid-sentence to wonder what on earth you are doing. Or maybe (very likely) she'll be too wrapped up in her own concerns to notice you. Because that's another important thing you learn as you get older and wiser: Not everybody is watching you. And even if a few of them are...so what? Is it worth missing a once-in-a-lifetime picture of a seemingly supersonic hummingbird barely one foot away from you? If you run inside and put on "proper clothes", that hummingbird will be long-gone by the time you re-emerge. Go ahead, be that eccentric fellow who is wearing his bathrobe outside as he walks around barefoot in the grass, sipping his coffee and admiring the clouds. The one who notices there's a hawk soaring way up high, drifting effortlessly on the ever-so-slight breeze that barely ruffles the leaves. I hereby give you permission to whisper "hi there" to a squirrel who has stopped mid-scamper, wondering who you are and what you're doing out here in the yard in your pajamas. Shouldn't you be back inside, scrubbing a pot or folding some laundry? Nope, not right now. There's a squirrel who is three feet away from you, head cocked to the side in wonder. Take this moment to gaze right back. Be that nutty neighbor who saves a beetle by flipping it back over and watching it fly away until it's only the tiniest speck in the big blue sky. Shed your veneer of cool; let go of the need to be "normal." You don't want to miss this one and only moment. LAST CALL and just a few spots left for my brand-new online photography course "Beyond Auto Mode: How to Really Work Your DSLR Camera." Join students from around the world--class starts this Monday, June 13, 2016. For all the course details and registration, click here. Well, I'm back down on Planet Earth! I just returned from BlogHer15 in New York and it was quite a trip! The award inspired me to keep on aiming for pictures of simple, natural beauty. Here's something else--or rather, somebody--who inspired me at BlogHer: Christy Turlington Burns. I remember, years ago when I still lived in New York, going to a little vegetarian restaurant way downtown and seeing Christy Turlington eating dinner with a friend across the room. This was when she was one of the top supermodels in the world, so it was a shocker to see her out-and-about and mingling with mere mortals, low-key with little makeup, yet still gorgeous in an other-worldly way that only supermodels can attain. She still is gorgeous today, but now she's the founder of Every Mother Counts, a non-profit organization dedicated to making pregnancy and childbirth safe for every mother--which makes her even more beautiful. Not a life-saver, but nonetheless inspiring to me at BlogHer: Gwyneth Paltrow. Even for us non-celebs, I think it's always good to remember that much of what we see in the media is just hype and hysteria. Chris Hadfield's You Are Here: Around the World in 92 Minutes: Photographs from the International Space Station. Hadfield is the Canadian astronaut who famously sang a version of David Bowie's "Space Oddity" while still in space. (That video has over 26 million views on YouTube--it's in the "Related Articles" section at the bottom.) His book surprised me because I found his writing and photographic views of the world to be downright poetic. And last but most definitely not least, the highlight of my trip was meeting Jayla, the three-week-old daughter of my long-time friend, Caren. Just look at that little face! It brought me right back to when my own children (now 8 and 11) were this teeny-tiny. Time flies, indeed. Babies are always inspiring to me because they're so new to the world, so fresh and flawless, and the very essence of hope is right there in their eyes, gazing right back at us, and glimmering. Pssssssst! Early Bird enrollment for the next session of my online photography course, The Art of Photography: How to Take Your Pictures to the Next Level, ends just one week from today, 7/31/15 (12:00 midnight EST). 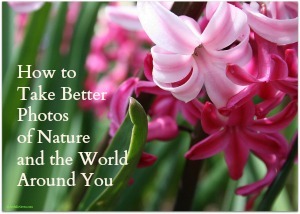 Save $15 by enrolling early and join me in August to create some inspiring pictures of your own! ♫ Space Oddity ♫ Sung above Earth in the ISS. Blows Bowie's version to PIECES!! I love that quote--but I sort of hate it, too. It's such a bracing reminder of how sneaky time can be, especially when it comes to children. You look up from your cereal bowl one morning and your "babies"--who, coincidentally, were both 6 pounds, 9 ounces when they were born--are now 7 and 11 years old and spout out words like "pathetically" and "unappetizing" (not together). When did that happen? Time is quite the rascal! I remember collapsing in tears the first time I had to weed out the baby clothes that no longer fit my son. I put most of the clothes into storage boxes because I just couldn't part with them yet. With the years, I've gotten MUCH better at parting with the kids' outgrown clothes (fortunately, because I need to do it about every six months), but I still catch myself sometimes, wistfully looking at my children and seeing them as they were (wee little ones! ), and as they are now (far less wee). Photography makes me be more mindful because it literally lets me stop time for a split-second. And then I have digital proof that the moment happened--bonus! It also helps me re-focus, quite literally, on the things people I love. It's with these sentiments in mind that I've created my newest photography e-course: The Charm of Children: How to Take Better Photos of Babies and Kids. I hope you'll join me on this journey of mindfully cherishing our little ones--capturing their beauty, their silliness, their cuddles--before they're not so little anymore. It's not just for parents and grandparents, but for aunts, uncles, godparents, cousins--anybody with lovable little ones buzzing about. Yes, you can have a full-time job (which includes parenting!) and still take this course. You'll get an email with the daily lesson, which you can do (or not do!) at your own pace. You can post your photographs in our private classroom on Facebook, and get (positive) feedback from me and your fellow students (usually from all over the world, which is a fringe benefit--students in my previous e-courses have haled from all over America, Canada, England, and Australia). At the end of the course, I'll send you a personal evaluation to help you continue your photographic journey with your children.